Train travel in Peru . . .
Cusco to Puno by train. Courtesy Discoverbyrail.com. Peru has several train services of interest to visitors, including the famous train to Machu Picchu where a confusing array of trains from several different operators compete to take you to the Inca ruins - this page will help explain the options. There are in fact two separate networks in Peru, the southern network which includes Cusco to Machu Picchu & Cusco to Puno on Lake Titicaca and the northern network which links Lima with Huancayo. Cusco to Machu Picchu for the famous Inca ruins. GMT-5 (there is no daylight saving time in Peru). UK citizens do not need a visa for Peru for tourist visits of up to 90 days. Cusco is the base city for visiting the famous Inca ruins at Machu Picchu and it's where most visitors stay. Although you can hike all the way up the Sacred Valley on foot along the Inca Trail, most tourists take a train from Cusco to Machu Picchu. There are 4 possible train boarding points, namely (1) Cusco station located in Cusco itself, sadly now only used by a local train for Peruvians only, (2) Poroy which is 13 km (8 miles) from Cusco, (3) Urubamba which is 53 km (33 miles) from Cusco and (4) Ollantaytambo which is in the Sacred Valley itself, 89 km (56 miles) from Cusco. There are two competing train companies, PeruRail is the main one, Inca Rail the smaller one. 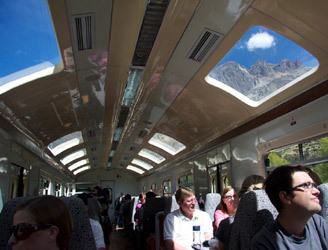 PeruRail operates a range of different train classes to suit different budgets from the cheap and cheerful Expedition through the mid-range Vistadome to the super-deluxe Hiram Bingham. 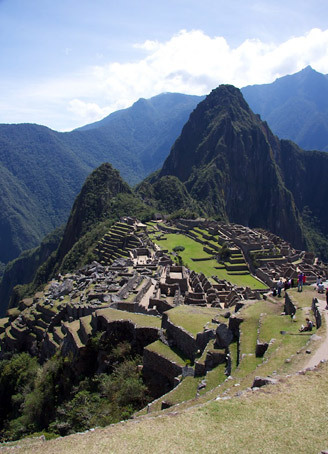 This page will guide you through the options for an unforgettable visit to Machu Picchu. Sadly, this is not in fact an option at all unless you're a Peruvian national. 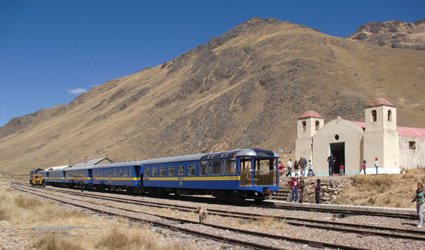 Since April 2009 the only train starting from Cusco's original main station on the Avenida Sol is the local, a subsidised daily service for Peruvians. Which is annoying it's now the only train that runs over the interesting Cuzco-Poroy section where the train uses a series of switchbacks to climb the mountainside. If you succeed in gatecrashing this train to experience the Cusco-Poroy section, let me know! Cuzco station depart at 07:02, Ollantaytambo arrive 09:50, Machu Picchu arrive 11:49. Machu Picchu depart 18:30, Ollantaytambo arrive 20:17, Cuzco station arrive 23:13. Local trains also run 3 times a day from Machu Picchu and Hidroelectric station (for the Machu Picchu hydroelectric power station), 40 minutes beyond Machu Picchu. Assuming you don't fancy trying to gatecrash the local, you'll need to take one of the tourist trains. 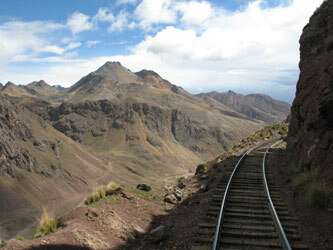 The closest station where you can board a tourist train is Poroy, a local halt 13 kilometres (8 miles) west of Cusco. The tourist trains sadly stopped using Cusco central station in April 2009. How do you get to Poroy? You'll need to take a bus or taxi from downtown Cusco to Poroy. A 3-seat taxi from Cusco to Poroy costs around 20-30 soles (£4-£6 or $6-$9) per taxi, and takes around 20 minutes. There's a local bus for 6 soles per person. Which train company to choose? 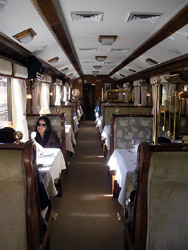 The trains from Poroy to Machu Picchu are mostly run by PeruRail (www.perurail.com) which is part of Belmond, the people who run the Venice Simplon Orient Express. PeruRail took over operation of this network from the Peruvian railway company ENAFER in 1999. 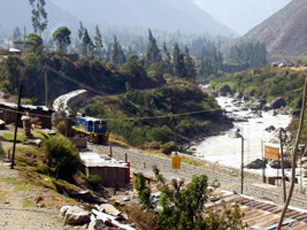 There is now one Poroy-Machu Picchu train run by competitor Inca Rail, www.incarail.com. What if these trains from Poroy are fully-booked? Going all the way from Poroy to Machu Picchu is the best option, but if you can't get a seat on one of the trains that start in Poroy, don't worry. There are a couple of trains from Urubamba to Machu Picchu (see option 3 below) and plenty of shuttle trains between Ollantaytambo & Machu Picchu, see option 4 below. It just means a longer bus or taxi journey from Cusco until you can board the train. The Hiram Bingham. This is the super-deluxe option and the most expensive, from around $475 (£285) each way per person, including gourmet brunch on the way out and dinner on the way back, a selection of Peruvian wine, cocktails, entertainment, bus connections & entrance to the Machu Picchu citadel plus guided tour. A real luxury experience! See the Hiram Bingham photos below. The Vistadome. This is the mid-range option, costing around $90 per person including complimentary snacks & non-alcoholic drinks served at your seat. It's a series of diesel railcars with panoramic windows as its name suggests, see the Vistadome photos below. The Expedition (formerly the Backpacker). This is the budget option, from around $77 each way per person. It has basic but reasonably comfortable seating with panoramic windows and a buffet car where you can buy non-alcoholic drinks and snacks. In many ways it's not really that different from the Vistadome. Poroy to Machu Picchu is 86 km (54 miles). Ollantaytambo to Machu Picchu is 38 km (24 miles). Poroy is 3486 metres above sea level, Ollantaytambo 2600m, Machu Picchu 2350m. 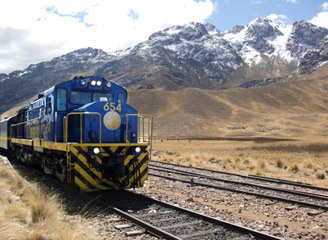 Urubamba is 53 km (33 miles) from Cusco, and the next best option to joining a train at Poroy. 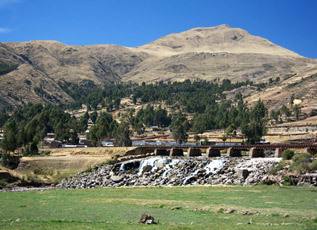 Only PeruRail operate from Urubamba. PeruRail run one Vistadome train from Urubamba to Machu Picchu at 06:50 arriving 09:25, returning from Machu Picchu to Urubamba at 15:48 arriving 18:43. Check current times at www.perurail.com. PeruRail also run a train called the Scared Valley train from Urubamba to Machu Picchu at 10:30 arriving 13:34, returning from Machu Picchu to Urubamba at 19:30 arriving 22:37. This train includes a gourmet lunch or dinner and complimentary soft drinks, alcoholic drinks extra. Check current times & on-board services at www.perurail.com. If you have any feedback or get any photos of this train or the food, please let me know! If you can't get a ticket for one of the PeruRail trains starting direct from Poroy or Urubamba, don't worry, there are many shuttle trains from Ollantaytambo to Machu Picchu, some run by PeruRail and others by Inca Rail. Ollantaytambo is 89 km (56 miles) from Cusco, 1 hour 40 minutes by taxi, so a longer bus or taxi ride, shorter train ride. PeruRail trains: www.perurail.com operates shuttle trains from Ollantaytambo to Machu Picchu at intervals through the day. Some of these shuttle trains are Vistadome and some the cheaper Expedition. Fares vary by date and departure, but Expedition fares start at around $35, Vistadome fares at around $54. 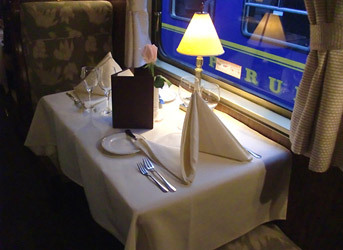 Check times and fares and book online at www.perurail.com. Ollantaytambo to Machu Picchu departures at 05:05, 06:10, 07:05, 07:45, 08:00, 08:29, 08:53, 09:15, 10:32, 11:52*, 12:55, 13:27, 15:37, 19:04, 19:30, 21:00. Journey time 1 hour 30 minutes. Machu Picchu to Ollantaytambo departures at 05:35, 08:53, 10:55, 13:37, 14:55, 15:20, 15:48, 16:22, 16:43, 17:23, 18:10, 18:20, 18:45, 19:30*, 20:50, 21:50. Journey time 1 hour 30 minutes. 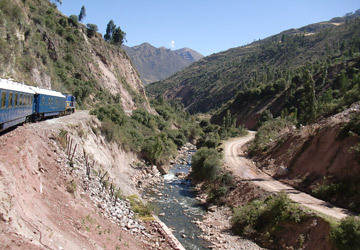 * = Sacred Valley Train, also run by PeruRail. Inca Rail trains: www.incarail.com runs several trains a day, leaving Ollantaytambo at 06:40, 07:20, 11:15 and 16:36, returning from Machu Picchu at 08:30, 14:02 and 19:00. Journey time around 1 hour 30 minutes, with fares from around $70 each way. Check times and fares on their website. 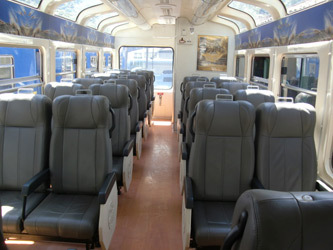 They now offer three classes, Machu Picchu class (economy), Executive class and First Class. These can be bought in advance online at www.machupicchu.gob.pe or in Cusco at the National Culture Institute (INC) at Avenida La Cultura 238, Condominio Huascar (in front of the Universitario Stadium). Since July 2011, visitor numbers have been limited to 2,500 per day, about the expected number on a normal day in a busy month such as June, but less than the numbers previously visiting in the busiest peak months of July and August, so book ahead at www.machupicchu.gob.pe. Entry tickets are now timed 06:30-12:00 or 12:00-17:30, so be sure of your entry period before booking your trains. If you book in advance at www.machupicchu.gob.pe (recommended) you can now print your own ticket. For lunch at Machu Picchu, you can eat lunch at The Sanctuary, at around US$33 it's expensive but saves you an hour travelling to Aguas Calientes and back for lunch in the town. 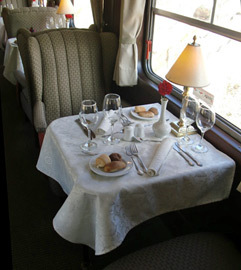 You can buy tickets for the PeruRail tourist trains from Poroy to Machu Picchu online at www.perurail.com. Train tickets can also be bought from Perurail offices at Lima Airport on level 2 between gates 13 & 14, or in Cusco at Portal de Carnes 214, Plaza de Armas, Cusco, call (084) 260809 or (084) 260792. 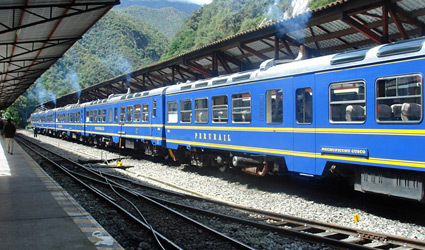 Tickets for the alternative Inca Rail service from Poroy or Ollantaytambo to Machu Picchu can be bought at www.incarail.com. Where is the station at Machu Picchu? How do you get to the Inca ruins? The station referred to as 'Machu Picchu' is in fact located in the local town of Aguas Calientes, approximately 8 km (5 miles) from the ruined Inca city of Machu Picchu. A bus link runs every 30 minutes from the station to the ruins costing US$24 return, payable in either US$ or local Peruvian currency. To find out more about the Inca ruins, see www.peru-machu-picchu.com or www.machupicchu.org. The Vistadome & Expedition trains (the latter previously known as the Backpacker) used to leave from Cusco's main San Pedro station on the Avenida Sol and spent half an hour climbing a series of Switchbacks or zig-zags up the mountainside to gain height. Unfortunately, all trains now start from Poroy (the Hiram Bingham always started here), and so miss this interesting section. 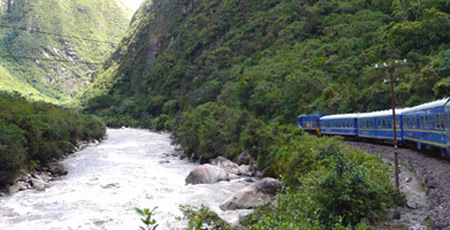 After Poroy the train descends into the Sacred Valley and the Andean foothills, along the Urubamba river. You'll pass colourful villages and herds of llamas. Cusco to Machu Picchu is 107 km (67 miles), Poroy to Machu Picchu is 86km (54 miles). The best views are on the left hand side of the train going up to Machu Picchu and on the right hand side returning, as the train follows the river and this is the side which the river is on, with the odd Inca ruin or terrace visible as the train runs along the Sacred Valley. PeruRail won't assign seats on a particular side, but you can easily move over if there are empty seats after departure. 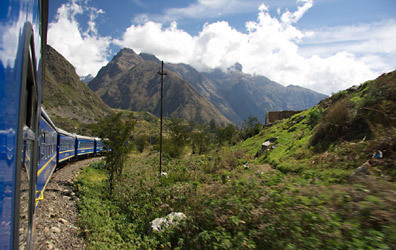 Above: The Expedition train from Cusco approaches Machu Picchu. Courtesy of 's'. This is the mid-range option, a good choice. The price includes complimentary snacks & non-alcoholic drinks served at your seat. Inside the Vistadome train. Photo courtesy of www.andybtravels.com. 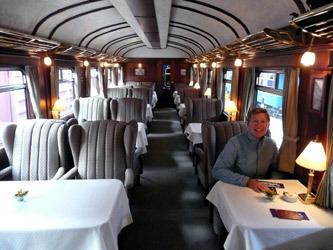 This is the luxury option, the most expensive of the trains to Machu Picchu and one in a category all by itself. This luxurious train ride includes a gourmet brunch on the outward trip and dinner on the way back, a selection of Peruvian wine, cocktails, entertainment, bus connections, Machu Picchu entrance fee and a guided tour. The Hiram Bingham, showing the open-air observation car at the rear. Photo courtesy of www.andybtravels.com. An elegant dinner is served on the way back. Photo courtesy of www.andybtravels.com. The Hiram Bingham train on its way to Machu Picchu. Photo courtesy of www.andybtravels.com. Better than the train to Machu Picchu? 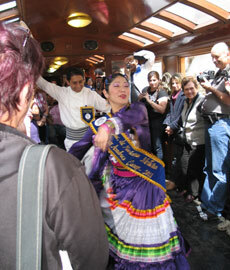 PeruRail also run two excellent trains between Cusco & Puno on Lake Titicaca, a scenic 385 km. A new luxury cruise train called the Andean Explorer with private sleepers, lounge, dining-car. It operates two slightly different itineraries in each direction, Spirit of the Water, Peruvian Highlands, Spirit of the Andres and Andean Plains & Islands. This costs around $1000-$2,500 per person including private sleeper & meals. The Andean Explorer cruise train is all-new, it started running in May 2017. Before May 2017 there was only a daytime train called the Andean Explorer - the name Andean Explorer now applies to the new luxury cruise train, the old daytime Andean Explorer is now renamed the Perurail Lake Titicaca train. Bear that in mind when looking at reviews or info from past years on the internet! Cusco to Puno is 385 km (241 miles). 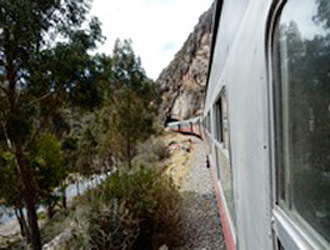 Fares for Perurail Lake Titicaca train: $202 - $346 per person in a seat, including meals. Fares for Andean Explorer 1-night trips: From $840 for one person or $960 for two people including lunch, dinner, breakfast & private en suite sleeper. Fares for Andean Explorer 2-night trips: From $2,140 for one person or $2,450 for two people including lunch, dinner, breakfast & private en suite sleeper. How to buy tickets: www.perurail.com for times, fares & online booking. These photos show the original pre-2017 Andean Explorer, which has now been renamed the Perurail Lake Titicaca Train. Feedback have been great - travellers say it's better than the train to Machu Picchu. The Andean Explorer train from Cusco to Puno at La Raya. Photos courtesy of Discoverbyrail.com. 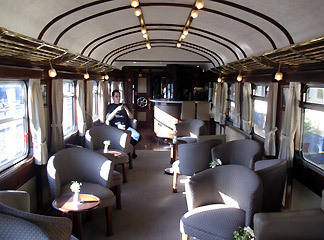 The bar-lounge in the Andean Explorer's tail-end observation car. The Andean Explorer at La Raya, showing the observation car with open-air viewing deck. Courtesy of Discoverbyrail.com. Ready for an elegant lunch... Photo courtesy of Discoverbyrail.com. The railway between Peru's capital Lima and Huancayo was once the highest railway in the world, until the Chinese built the line to Lhasa in Tibet. 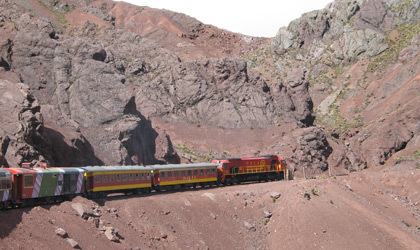 The air-conditioned Tren de Sierra links Lima & Huancayo once or twice a month (outside the November-April rainy season, at least), with touristico (1st) class & clasico (2nd) class & bar car. The Touristico fare is around 385 Soles ($125 or £80) and includes breakfast and complimentary tea, coffee, water and soft drinks. Clasico fares start at 230 Soles ($75 or £50). You can check departure dates & book tickets online at www.ferrocarrilcentral.com.pe. In Lima, the train departs from Desamparados or Monserrate stations. Bear in mind that the high altitude doesn't suit everyone! 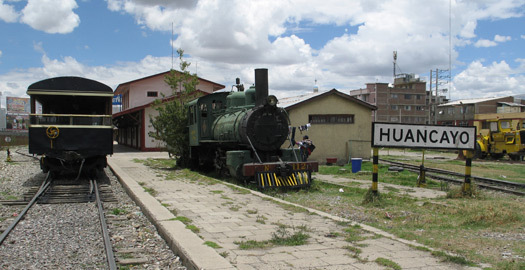 Until some years ago, twice daily trains used to link Huancayo with Huancavelica. The route then ceased for several years but it's reported that in 2015 this line is back in action. 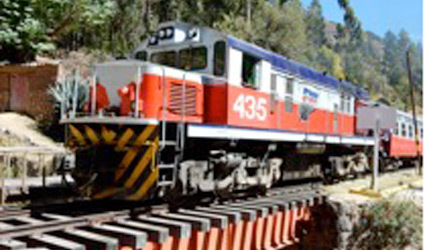 Traveller Thomas Gisler reports (September 2015): "The famous Huancayo - Huancavelica railway (the 'Macho Train') is back to service! It is scheduled three times a week, leaving Huancayo on Monday, Wednesday and Friday at 06:30 and leaving Huancavelica on Tuesday, Thursday and Saturday at 06:30. as well. The duration of the trip is roughly six hours though it can easily last longer. The journey can be done as a long day trip, taking local transport from Huancavelica back to Huancayo but an overnight stay in Huancavelica is much more convenient. On the day of my visit there was a huge queue at the train station in Huancayo as early as 05.45. There is no seat reservation or booking of tickets in advance in Huancayo, so be early at the train station to avoid disappointment! Ticket prices are very cheap at 9 soles (less than $1) 2nd class and 13 soles in the buffet car, also referred to as "first class". This is the last remaining 'non-tourist-train' in Peru, serving the locals and offering a unique train experience to the few tourists who make it there despite the lack of any information available online. The journey is very scenic as the train is following the valley and its river, passing through tiny little villages. On arrival in Huancavelica it is possible to buy the ticket back to Huancayo for the following day, which is definitely a good idea. 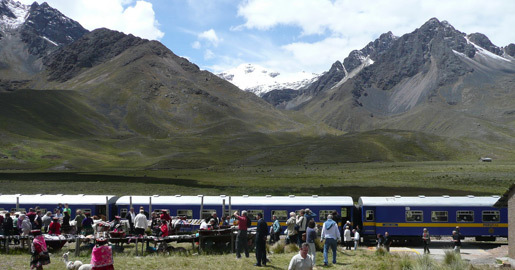 The 2015 Huancayo to Huancavelica train. Photos courtesy of Thomas Gisler. To get the most out of your trip to Peru, you'll need a decent guidebook. For the serious independent traveller this means either the Lonely Planet or the Rough Guide. Both guides have everything you need - plenty of background historical and cultural information, plus practical information. www.tripadvisor.com is the place to find independent travellers' reviews of all the main hotels. Overland travel by train around South America is an essential part of the experience, so once there, don't cheat and fly, stay on the ground! But if a long-haul flight is unavoidable to reach it in the first place, try Virgin Atlantic who now fly from the UK to India, a good choice for both price and service.